By all accounts, the American Hockey League’s (AHL) inaugural 2015-16 Pacific Division campaign was a smashing success. It accomplished all its goals, and then some. Fans can look forward to the 2016-17 AHL season when it faces off Oct. 14. All five California-based franchises return: the Pacific Division champion Ontario Reign (Los Angeles Kings) and division runner-up San Diego Gulls (Anaheim Ducks) along with the San Jose Barracuda (San Jose Sharks), Bakersfield Condors (Edmonton Oilers) and Stockton Heat (Calgary Flames). The division proved extremely competitive last season, with the Barracuda securing the league’s final playoff berth in the final game of the AHL’s regular season schedule. The five California teams join the San Antonio Rampage (Colorado Avalanche) and Texas Stars (Dallas Stars) as returning members in the division. Those seven teams are joined this season by the transplanted and renamed Tucson Roadrunners, the AHL affiliate of the Arizona Coyotes. During the off-season, the Coyotes purchased their AHL affiliate in Springfield, Mass., and moved the team to southeastern Arizona to better serve the parent club with a pipeline of readily available talent. The Roadrunners face off their inaugural AHL season Oct. 14 when they visit San Diego. The five California teams, plus Tucson, will each play 68-game regular season schedules as opposed to 76 games by all other teams in the league. Playoff berths will be determined once again by points-percentage (points earned divided by points possible). The five California teams played each other 12 times last season. That number will vary this season. Each of the California-based teams (plus Tucson) will play 60 games against teams from the Pacific Division and eight non-divisional games against selected teams from the Western Conference’s Central Division. For instance, Tucson will play Ontario and San Diego 12 times each, but will play San Jose, Bakersfield and Stockton only eight times each. Likewise, San Diego will play Tucson and Ontario 12 times each, Stockton and San Jose 10 times each, but Bakersfield just eight times. NHL training camps traditionally open in mid-September, often with a rookie camp preceding the main camp. All players under contract to an NHL team, including those on two-way contracts, compete for jobs on opening day rosters. Players also can be signed to a pro tryout (PTO) and participate in the main camp. The NHL season faces off Oct. 12. While AHL clubs can sign players directly to contracts, the majority of AHL rosters are supplied by NHL parent clubs. NHL teams usually make cuts in a series of stages. Players assigned to AHL teams will practice with their respective AHL clubs prior to the start of the AHL season. All 30 active NHL teams have AHL affiliates. Key points in training camp include conditioning and assessment of skills for young prospects. Anaheim’s rookie camp opens Sept. 15. The Ducks will participate in the 2016 Rookie Showcase, a three-day rookie tournament along with the Sharks and Avalanche, Sept. 17-19, at the Ice Centre at the Promenade in Westminster, Colo. Meanwhile, Kings and Arizona Coyotes rookies will get together for games Sept. 20-21 at Gila River Arena in Glendale, Ariz. The Kings will hold an intra-squad game Sept. 25 at Citizens Business Bank Arena, home of the Reign. As part of AHL training camps, San Diego and Ontario will face off twice in the preseason: Oct. 6 in Ontario and Oct. 10 at the Honda Center in Anaheim. San Jose will host Tucson (Oct. 6) and Bakersfield (Oct. 9) in a pair of preseason games at Sharks Ice. 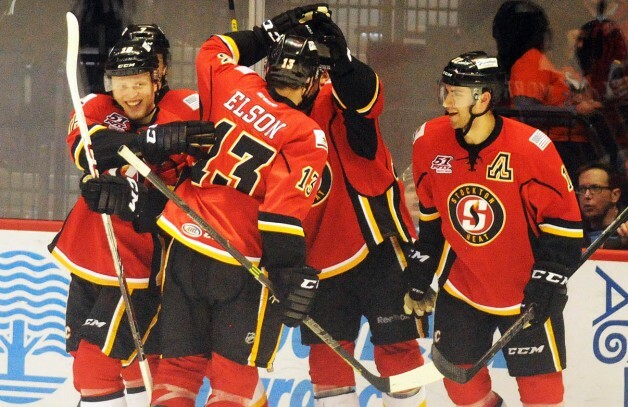 Stockton will host Tucson (Oct. 7) and play at Bakersfield (Oct. 8) in another pair of preseason games. Ontario entered the 2015-16 season as the defending Calder Cup champion, paced the Pacific Division with a 44-19-4-1 regular season record and defeated the Barracuda (division semifinals) and Gulls (division finals) to reach the Western Conference championship series. Despite posting the conference’s top record during regular season play, the Reign was swept in four games by the Central Division playoff champion Lake Erie Monsters, who went on to claim the 2016 Calder Cup championship with a four-game sweep of the Eastern Conference playoff champion Hershey Bears in the Calder Cup Finals. Lake Erie won the opening two games in the best-of-seven conference finals in California by scores of 4-3 and 3-2 and deposed Ontario as AHL champions by scores of 4-0 and 2-1 (in double overtime) in Cleveland. The catalyst of Lake Erie’s championship run was goaltender Anton Forsberg, who went 9-0 with a 1.34 goals-against average in closing out the Monsters’ epic championship run. Reign netminder Peter Budaj led the AHL in regular season totals for wins (42), GAA (1.75) and save percentage (.932). He has signed a one-year contract extension with the Kings. The Reign began reloading for another run at the Calder Cup championship by resigning Sean Backman, the team’s leading scorer last season (career highs with 21 goals and 55 points) and AHL Man of the Year selection, and fan favorite Paul Bissonnette, a 6-foot-2, 216-pound right winger, who enters his 12th professional season. Ontario head coach Mike Stothers said it is important to surround young players with veteran players who are familiar with the program and team culture. Backman said it’s important for players coming into training camp to set the standard higher than last season in an effort to win back the Calder Cup trophy. Other off-season veterans signed by the Reign include forward T.J. Hensick (40 points in 65 AHL games last season with Charlotte and Utica) and Brett Sutter (612 career AHL games with 251 points). A multiple selection to the AHL All-Star Classic, Hensick has collected 471 points in 503 career AHL games and has played 112 career NHL games with Colorado and St. Louis. The 30-year-old Michigan native has also enjoyed a storied youth inline hockey career with annual participation in the NARCh Finals. 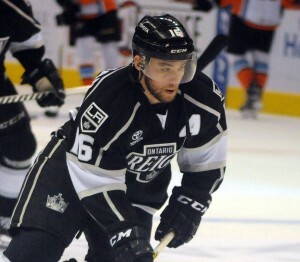 The 29-year-old Sutter, who is entering his 10th professional season, is the son of Kings head coach Darryl Sutter. Turning to youth, the Reign has signed Hobey Baker Award finalist Daniel Ciampini, who won a NCAA championship in 2014 with Union College and produced a 50-point senior season in 2015. Former L.A. Junior Kings forward Shane McColgan (Manhattan Beach), forward Quentin Shore, younger brother of Kings center Nick Shore, and Mississauga Steelheads goaltender Jack Flinn (signed by the Reign last April) are among those expected to attend the Kings rookie camp. Los Angeles native Miles Koules, who recorded 26 points in 59 games during his rookie season in 2015-16 with the ECHL’s Quad City Mallards and Wichita Thunder, attended July’s Kings development camp. Goaltender Jonah Imoo, son of Kings goaltender development coach Dusty Imoo, signed at PTO with the Kings following the development camp. “Workin’ on the legs for main camp … Can’t wait to be back in L.A.” the younger Imoo tweeted. The Ducks have signed six players who appeared on last season’s Gulls roster to contracts or contract extensions. Anaheim signed forwards Michael Sgarbossa and Joseph Cramarossa and defenseman Andrew O’Brien to one-year contract extensions. Sgarbossa is a veteran of 228 career AHL games while Cramarossa has appeared in 162 career AHL games and O’Brien has appeared in 125 career AHL games. The Ducks also signed right wing Corey Tropp (39 points with the Gulls and Albany in 2015-16) to a two-year contract extension and goaltender Dustin Tokarski (2012 Calder Cup champion with the Norfolk Admirals) to a one-year contract extension. The Ducks signed right wing Stefan Noesen (32 points in 65 games with the Gulls in 2015-16) to a one-year contract. Anaheim also signed former Ontario defenseman Jeff Schultz to a one-year, two-way contract. A first-round selection in the 2004 NHL Draft by the Washington Capitals and a six-time Stanley Cup participant with the Capitals and Kings, Schultz (6-6, 217 pounds) collected 18 points in 66 regular season games in Ontario in 2015-16 and registered four points in 13 Calder Cup playoffs. He won a Calder Cup championship with Hershey in 2006. Anaheim also signed left wing Mason Raymond, who appeared in 29 games with Calgary and 15 games with its AHL affiliate in Stockton, to a one-year, two-way contract. Meanwhile, the Gulls have signed seven players to contracts for the upcoming AHL season: defensemen Stu Bickel and Brian Cooper and forwards Antoine Laganiere, Zac Larraza, Tyler Morley, Scott Sabourin and Nick Tarnasky to one-year contracts. Bickel appeared in 59 games with San Diego last season (leading the team with 210 penalty minutes), while Cooper made his professional debut with the Gulls in 2015-16. Laganiere piled up 32 points in 57 games last season with the Gulls and Larraza appeared in 12 games with San Diego on a PTO. Morley made his professional debut with San Diego last season. He appeared in two games with the Gulls, recording two points, after completing four years at the University of Alaska-Fairbanks where he posted 122 points in 129 career games with the Nanooks. He impressed Ducks’ executive by scoring a goal in July’s development camp scrimmage. Tarnasky joins San Diego after spending the last two seasons with the AHL Hartford Wolf Pack. 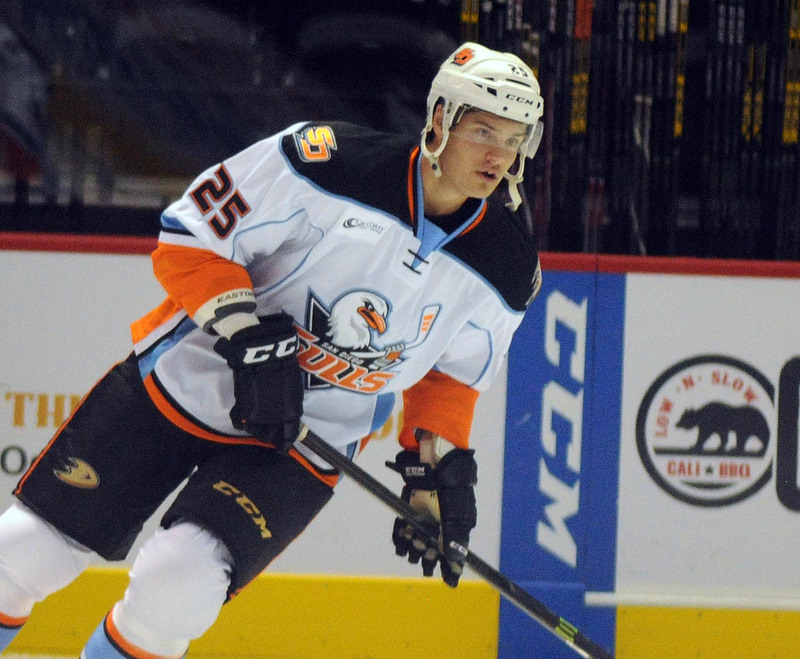 Among the Ducks’ pool of top prospects, 16 played in San Diego last season. Forwards Nick Ritchie, Ondrej Kase and Kalle Kossila – all Gulls last season – participated in the Ducks’ annual prospect development camp in early July. All three figured in the scoring in the July 4 scrimmage. Ritchie collected a goal and assist, while Kase and Kossila each scored one goal. Ritchie received multiple call-ups last season totaling 33 games with the Ducks. The 6-2, 230-pound first-round pick in the 2014 draft collected two goals and four points with Anaheim while tallying 16 goals and 30 points in 38 games in San Diego. The scrimmage is an opportunity for college and amateur free agents to have an opportunity to impress executives in the Anaheim front office. It is also an opportunity for the draftees of the past three years to get together as a team before they scatter to their assigned teams in the fall. This year’s first-round selections Max Jones (24th overall) and Sam Steel (30th overall) both saw action in the scrimmage, though on opposite sides. Neither appeared on the scoresheet, but Jones’ speed was noteworthy. Ritchie’s experience with the Ducks and Gulls last season during his rookie season seemed to provide him with an advantage during the scrimmage to cap the four-day development camp. Ritchie, who has learned to use his size advantage to create space from his left wing position, has set a goal to become a full-time NHLer this season. Kase, a Czech native, accumulated 14 points in 25 games last season in San Diego while Kossila, a Finn, picked up four goals in six games. Right wing Deven Sideroff, who had a cup of coffee with the Gulls last season after skating four seasons with the WHL’s Kamloops Blazers, also took part of July’s development camp. There are a number of players on 2015-16 Pacific Division team rosters who have signed with other AHL teams for 2016-17. Forward Matthew Ford, who led Bakersfield with 51 points last season, has signed a two-year AHL contract with the Grand Rapids Griffins. The California native racked up 27 goals and 24 assists in finishing a three-year contract with the Edmonton organization. “Time to pull the winter jackets out of storage,” Ford, the proud father of a newborn son, tweeted after inking the deal. Bakersfield blueliner Brad Hunt, who ranked second on the team with 41 points last season, has signed a one-year, two-way contract with the NHL St. Louis Blues and is expected to be assigned to the Chicago Wolves, the Blues’ AHL affiliate. Stockton has inked former Gulls forward Matt Bailey to an AHL contract after Bailey had spent the first two years as a professional playing for the Ducks’ affiliates in Norfolk and San Diego (where the former University of Alaska-Anchorage captain set a career high last season with 19 points). Leaving Stockton as free agents for other AHL teams are forward Mitchell Heard (Charlotte) and goaltender Kent Simpson (San Antonio). San Jose forward Ryan Carpenter, who led the Barracuda last season with 37 assists and 55 points in 66 games and earned accolades as the AHL’s Man of the Year for his community work, has signed a one-year contract with the NHL parent club. “Excited to be a part of the San Jose Sharks organization for another year,” Carpenter tweeted. Carpenter was among six Barracuda players who were called-up to the Sharks during the NHL team’s history-making run to the Stanley Cup Finals last season. Left wing Ryan Hamilton, who ranked third on the Bakersfield scoring chart last season with 33 points, has resigned with the Condors. This will be his 11th AHL season and third in the Oilers’ organization. Stockton defenseman Tyler Wotherspoon has signed a one-year, two-way deal with the NHL parent club. Wotherspoon played 53 games with the Heat in 2015-16 (his third year in the Calgary organization); he also spent 11 games with the Flames last season. The Three-Way Chevrolet Condorstown Outdoor Classic presented by Mission Bank is scheudled Jan. 7 at Bakersfield College’s Memorial Stadium against the Ontario Reign. It is the signature event of the nearly three-week long Winterfest, which will begin on Dec. 21 and conclude with the Outdoor Classic. More than 100 teams are expected to participate in a youth and adult tournament that will be held in conjunction with the event.